Do you or your child have autism? Then you’ve probably heard about the therapeutic benefits of weighted blankets for autism, sensory processing disorders, ADHD, ADD and Aspergers. 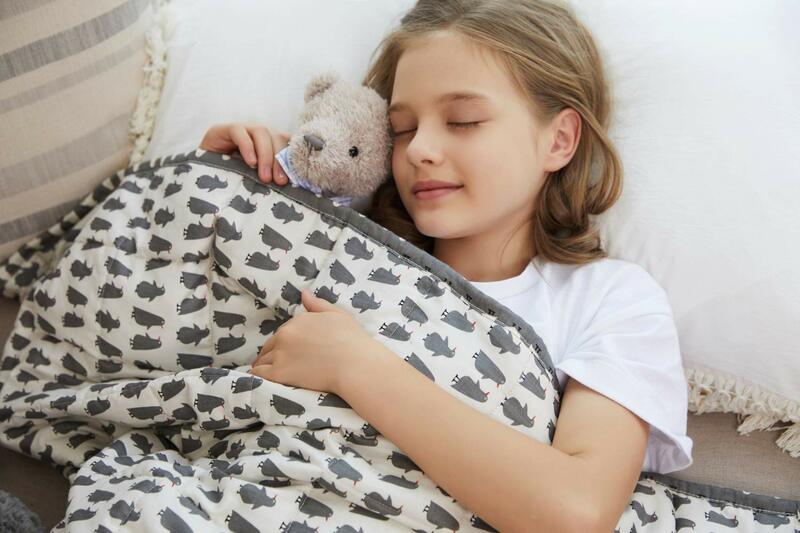 In fact, weighted blankets are increasingly being used to help with a range of common issues, from insomnia to anxiety – but what many people don’t realise is their origins lie in a therapy developed specifically for children on the autistic spectrum. Let’s look briefly at how weighted blankets developed, how they work and why they may be so beneficial to those with autism. Heavier than a regular blanket, weighted blankets apply a gentle ‘hug’ like sensation, called deep touch pressure, on the body of the user. This gentle pressure encourages the brain to release neurotransmitters like serotonin and dopamine, which are linked with improved mood and relaxation. Some of the earliest research in this area was produced by Temple Grandin, who was herself on the autistic spectrum. ‘used to crawl under sofa cushions and have my sister sit on them’. This led her to develop the ‘squeeze’ or ‘hug box‘, a device which exerted deep touch pressure on its users. Temple’s research discovered that the deep touch pressure both calmed and reduced stimulating behaviours in children with autism and ADHD. Whist you can still buy a ‘hug box’ they’re expensive, so this is where a weighted blanket can be such a huge help, as it applies deep touch pressure in a more affordable and practical way. According to research, people with autism are often deficient in melatonin. Melatonin is linked with sleep and regulation of the body’s internal clock and it’s the hormone that tells your body when it’s time for bed. Since many children with autism struggle to produce enough melatonin on their own, they often suffer from an erratic sleep schedule and ongoing sleep issues. This puts pressure on the nervous system and can lead to irratability and anxiety. Employing the deep touch pressure therapy of a weighted blanket, however, helps the body to release melatonin naturally, which for many children (and adults) with autism, has successfully aided better sleep. Children with autism are also often low in brain serotonin. Sometimes called the ‘happy’ hormone, serotonin helps to calm the nervous system and is linked with mood and relaxation. A deficiency in serotonin can make it hard for children and adults with autism to calm down and ‘switch off’, especially at night. This is where the gentle pressure of a weighted blanket may help a person with autism to self sooth, as it supports the body to naturally release the serotonin. In fact, many parents find that draping a weighted blanket across their child’s shoulders, or lap, during the day, can help their autistic child to feel calmer and less anxious. Serotonin is also very closely linked with sleep, as it naturally converts to the ‘sleep’ hormone melatonin. If you or your child has autism you’ll know how hard it can be to smoothly transition from one activity to another – especially a high energy activity to a lower paced one. This can make it difficult for children with autism to sit down and focus in a classroom environment, especially after an energetic play time or PE lesson. Whilst a weighted blanket may not be practical in a classroom environment, many teachers and parents have found a weighted lap pad, or vest, can help an autistic child to transition more easily into a focused classroom environment. This study even found that weighted vests may improve classroom behaviour and attention spans. Sensory processing disorders (SPDs), where the brain has difficulty processing information coming in from the senses, are becoming increasingly common. Whist not all children, or adults, with autism have an SPD, it is very common. SPDs usually manifest as an over or under sensitivity to everyday stimuli, such as touch or noise. For those with an under-sensitivity, it can often lead to a craving for extra sensory input – be it hugs, lights or fidget tools. This is where the deep touch pressure of a weighted blanket may help autistic kids and adults with sensory needs, since they help provide the extra sensory stimuli they often crave. Here are 3 weighted blankets designed with sensory kids in mind. Many people with autism have poor spatial awareness, which can lead to clumsiness and a sense that you can’t quite feel were your body is. Alex Lowry has autism and explains this feeling perfectly on his blog. A weighted blankets may help here, since the additional weight applies gentle pressure on the sensory receptors, providing autistic children and adults with a better sense of their own limbs and body movements. Do Weighted Blankets Work For Everyone With Autism? Weighted blankets have proved an almost revolutionary aid for many people with autism, but they don’t work for everyone. If a child with autism doesn’t respond well to a weighted blanket immediately (many do), it may just be a matter of persevering. Other times, especially for people with an acute oversensitivity to touch, the stimulus of a weighted blanket may simply feel too much. Try borrowing a weighted blanket first (if you can) or look for a weighted blanket with a 30 day money back guarantee, so you can return it (in perfect condition!) If necessary. For children – 10% of a child’s body weight, plus 1 or 2 pounds. For adults – 10% of ideal body weight. 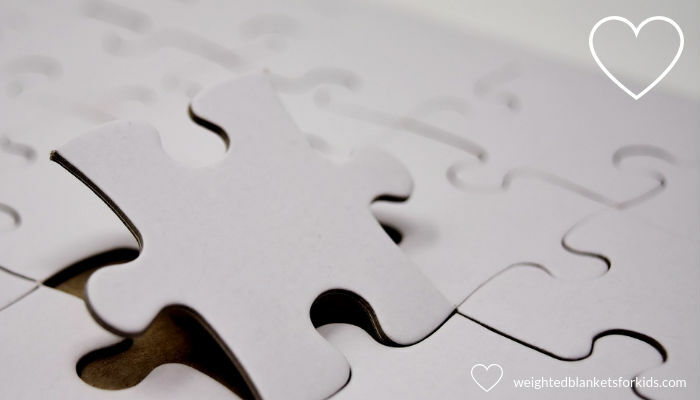 If you find you or your child’s weight falls between 2 weight sizes, it’s usually recommended you start with the lighter weight first. Weighted blankets come in a range of fabrics and designs, but for sensory seeking autistic children, a Minky Dot weighted blanket often works well. They’re extremely soft and tactile to the touch & the fabric features raised dots for some added sensory input. If your child is over sensitive to touch or heat, a more breathable cotton cover or a weighted blanket designed for hot sleepers may suit them better. Never use a weighted blanket with an autistic child or adult who can’t move the blanket off their body unaided. Harkla Weighted Blankets – this popular Minky Dot fleece is blanket good for sensory seekers. Mosaic Weighted Blankets – range of handmade blankets for kids with autism & ADHD. If you’re an adult with autism, try the YnM adult weighted blanket or this Quility Minky Dot blanket. Both are best sellers and on the more affordable end of the weighted blanket spectrum. For more choice and expertly made hand made options, check out Mosaic Weighted Blankets. Lastly, if you’re sensitive to heat or get hot easily, try one of these. It’s estimated autism affects 1 in 59 children and young adults under 21 living in the United States – a figure that appears to be on the rise. Autism is part of our society and the symptoms can make the routine of everyday life challenging for autistic children and adults, as well as many parents and carers. 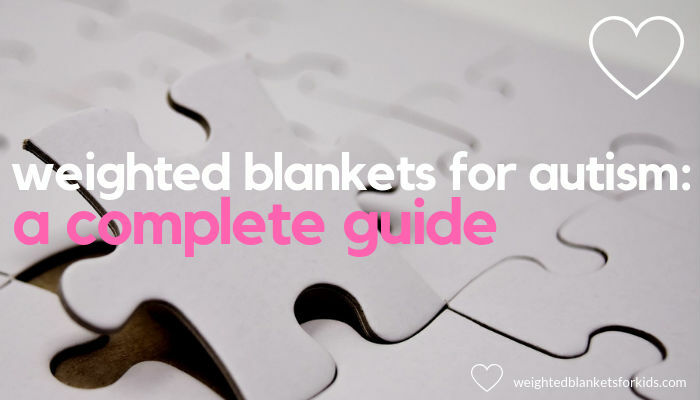 Whist weighted blankets for autism aren’t guaranteed to work for everyone on the autistic scale, for many they’ve offered a wealth of benefits – from improved sleep, relaxation and mood to increased focus and attention. If you decide to try a weighted blanket, please follow the manufacturer’s guidelines or consult a registered healthcare professional for advice based on you, or your child’s, individual needs.